Have you ever seen the Westminster Dog Show on television? The array of dogs being paraded in front of the cameras is truly astounding. The dogs making it to the best in show competition range from the spunky little Pekinese to huge Newfoundland dogs. As you might imagine, as much as people love their dogs, canine-themed collectibles in every breed imaginable make up clever conversation-starting groupings. Some of them can be worth tidy sums, too. Even if you just focus on cartoon dogs, there are plenty of choices available. After all, you'll find Snoopy, Goofy, and Huckleberry Hound to contend with. But you don't want to forget about Marmaduke, Pluto, and Scooby Doo, right? These are fun character dogs, no doubt. But it's not all fun and games when considering values. In fact, you might want to mull a few figures before you go barking up the wrong tree. If you were lucky enough to save your Snoopy phone from the mid-1970s, you might be able to sell it for $50-75 dollars today. An original animation cel featuring Disney's Goofy could be worth more than $100. And it is not uncommon for lapel pins featuring all types of cartoon dogs, including both Snoopy and Goofy, selling for an amazing $25 apiece. Yes, the dog definitely has its day when it comes to collecting. Of course, many people prefer dog collectibles that more closely resemble the real thing. This is where shopping at antique malls and shows gets really fun, since you'll most always find an array of dogs to choose from. One of the most common is the poodle. Lots of people are familiar with the poodle skirt made popular during the 1950s, but they don't realize that poodles adorned everything from shower curtains to light switch plates to powder compacts back then as well. Some of those poodles can be pretty pricey, too. A McCoy poodle ceramic planter might set you back $40 to $50, if you are lucky enough to find one in excellent condition. A Rosenthal poodle figurine dating back 30 to 40 years would probably go for $125 or more. And a stuffed Steiff poodle named "Snobby" usually will bring around $150 to $200 in the right market. If you're not a poodle fan, and lots of people aren't, then perhaps a German Shepherd would tickle your fancy. From cast iron doorstops to vintage prints dating back to the the 1920s, this handsome breed has been depicted in many ways throughout the years. 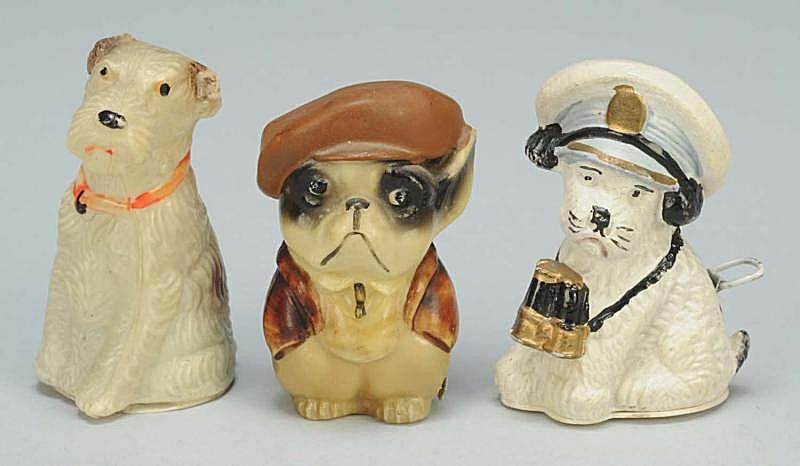 Or, how about a variety of Royal Doulton dog ceramic figurines? You'll find lifelike representations of dachshunds, collies, terriers, bulldogs, and a host of other breeds with the Doulton mark ranging in price from affordable at under $20 to out of reach for many folks at $500. Then there are all the toys, pins, and lamps shaped like dogs. Fabrics, purses, and puzzles have also been decorated with dogs. And you won't want to forget about the books, postcards, and advertisements depicting dogs, too. As you see, man's best friend really gets around. Take a look around your own home. Beyond your own lovable pooch, what kinds of dog collectibles have you accumulated over the years? A favorite aspect of collecting is learning about cultural connections. Discovering how leaders and pop culture icons profoundly influenced the desires of average Americans during the past can bring a seemingly ordinary collection to life. This certainly extends to President Franklin D. Roosevelt (FDR) and how he influenced dog collectibles. FDR's White House included a Scottish terrier named Fala. If you have been a collector for any length of time, you've probably noticed some of the plethora of Scottie dog collectibles spawned by Fala's influence while you were out browsing around. In spite of Eleanor Roosevelt feeling the nation's first home wasn't an appropriate place to raise a puppy, FDR was so fond of his four-legged companion that he always kept him close and took him everywhere. The dog even ate his meals in Roosevelt's study and slept in a chair at the foot of the President's bed. As you can imagine, Fala got lots of press coverage during the first few years of World War II. Before long, his image started showing up everywhere and on every type of merchandise imaginable. Scottie dog candy containers, cigarette boxes, and figurines could be purchased in dime stores. Glass powder jars with Scotties perched on top of colorful lids, kitchen tumblers with Scottie decals, and yards of fabric featuring the familiar canine became quite popular. Anything and everything under the sun was produced with Fala in mind. When collectors seek these items now, they can find a wide variety in all sizes and price ranges. And, they can make a fun collection as narrow or broad as they like by simply deciding what appeals to them most and focusing on those particular Scottie finds. It's hard to predict which collectibles will rise in value over time, but rest assured that coming generations will look back on our current time with nostalgic fondness. With the love of our canine companions stronger than ever, it's a safe bet folks will still be collecting anything and everything related to dogs.